安裝完成 VMware ESX(i) 這一台 Server 其本身不提供任何圖形控制介面,所以一般在使用上是透過另外一台桌機來進行遠端管理,通常是以網路來進行連接.設定好 VMware ESX(i) 的 IP 之後我們需要找一台桌機使用 Windows 系統的,透過 web 的方式去直接連接到 VMWare ESX(i)這一台 Server. 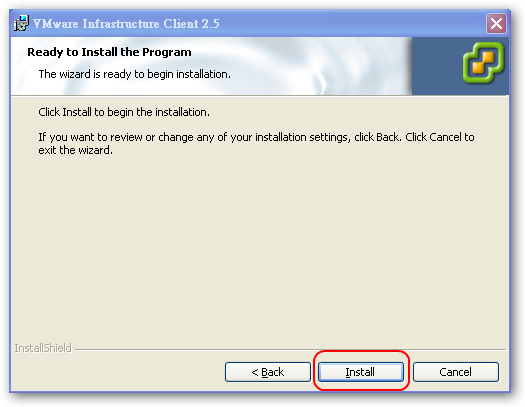 如下圖所示在瀏覽器 web Browser (IE , FireFox…) 鍵入剛剛 VMware ESX(i) 設定好的 IP,點選下載 VMware-viclient.exe 管理程式. 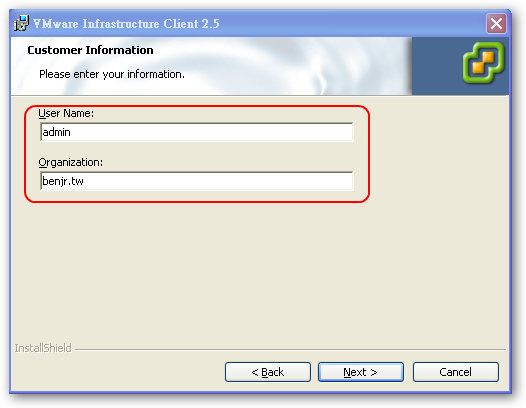 這一隻工具 VMware Infrastructure Client 就是在 Windows 系統下提供給使用者管理 VMWare ESX(i) 介面,你可以針對虛擬化環境做修改或是針對不同的 VM 來管理這些之後都會陸續談到.如同安裝所有的 Windows 程式很簡單很方便的連續使用下一步都用預設值就可以完成 VMware Infrastructure Client 的安裝. 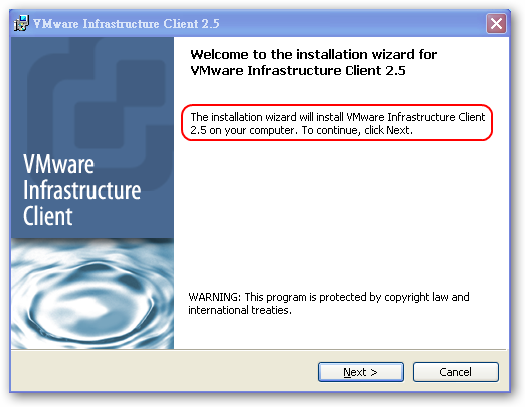 再三確定是否要安裝 VMware Infrastructure Client ,當然是要安裝選擇下一步. 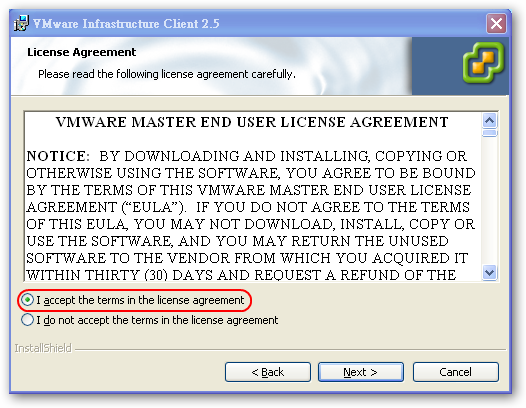 版權宣告,沒有別的選擇只能勾選 "I accept the terms in the license agreement" 要不然無法進入下一個步驟. 這裡只是一些系統的訊息 User Name 跟剛剛在系統使用者(root)無關,之後要登入系統還是會用到 root 和其密碼. 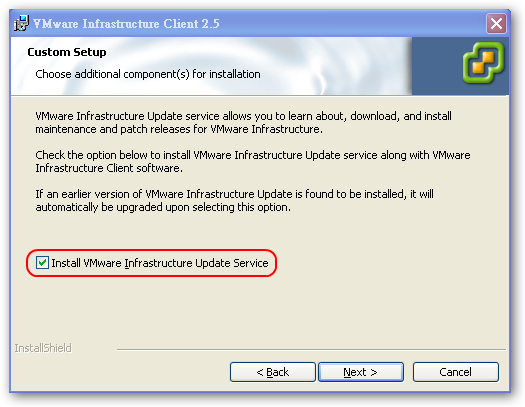 勾選 "Install VMware Infrastructure Update Service" 可以讓系統跟 VMWare 同步做系統的更新. 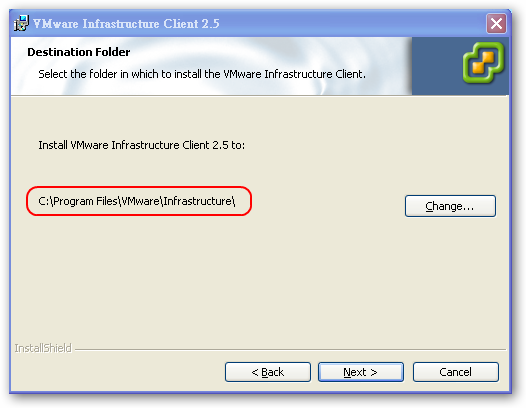 預設安裝路徑 C:\Program Files\VMware\Infrastructure\ 這邊單純就是存放 VMware Infrastructure Client 工具的所在. 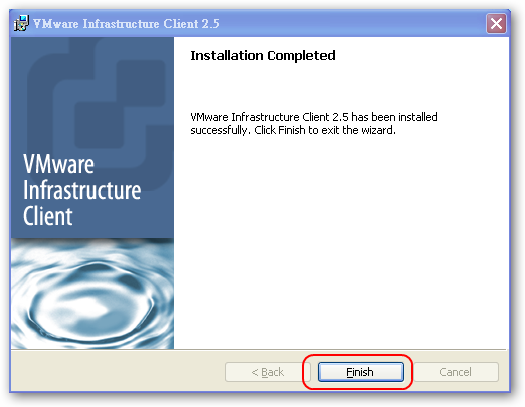 按下 "Install" 就會開始安裝 VMware Infrastructure Client . 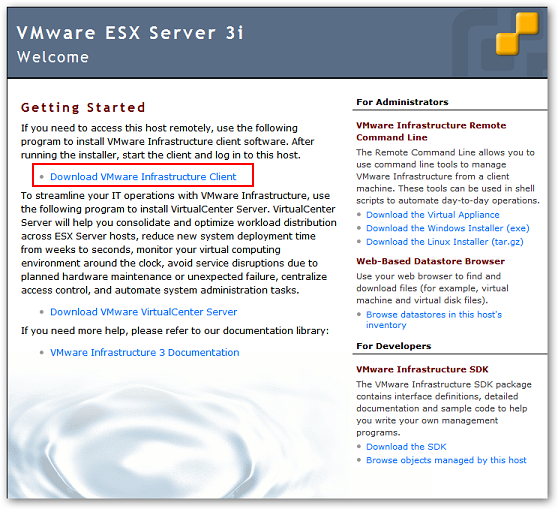 發生了一件怪事,安裝好的 VMware ESXi 3.5 U3 桌機能正確連接到 VMware ESXi web ,但是 VMware-viclient.exe 就是無法下載,怎麼按 "Download VMware Infrastructure Client" 就是沒任何反應?? ?連進去了 VMware ESXi 的 command Line 也找得到這個檔案,但為什麼就是不能下載 VMware-viclient.exe 呢!!是路徑發生問題了嗎??我系統有兩顆硬碟是因為這樣嗎??所以移除了一顆之後真的問題都解決了!! !這是為什麼阿,上 VMware 的官方網站也沒看到相關的問題討論? ?